Located directly on the water, the Lake Cottage provides a unique lake experience. The building was moved to its current location in the 1930’s and has given generations of guests an opportunity to be “right on the water”. Relax on the screen porch and listen to the sound of the loons. Recently remodeled kitchen, bath and master bedroom make this the perfect vacation spot. Maximum sleeping capacity is 9 people. 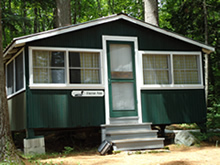 Each of our cabins is fully equipped with all the amenities of home. 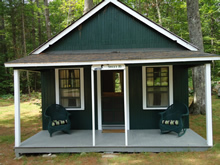 The Lake Cottage has a kitchen, living area, screen porch, bathroom with shower/tub and four bedrooms. The kitchen has a full size refrigerator, microwave, gas stove/oven, toaster, coffee pot, dishes, glasses, pots & pans, silverware. We provide pillows and one blanket per bed. Wood burning stove in the living room for cool mornings or evenings. The cabins do not have telephones or televisions. All cabins have an outside picnic table and charcoal grill. Need a Few More Beds and a Bathroom? If you could use an extra bedroom and bathroom for your family, we have two overflow cottages that can be rented in conjunction with any of our four main cottages. This building is located next to the Birches. Fresh Air provides an extra bedroom and bathroom for your extended family. Rented in conjunction with any of our four main cottages, Fresh Air is the perfect addition. Fresh Air has been an actual “honeymoon cottage” for two weddings. Additional sleeping for 4 people with 1 queen bed and 1 double bed. This building is located next to the Schoolhouse. Sweet 16 provides an extra bedroom and bathroom for your extended family. Rented in conjunction with any of our four main cottages, Sweet 16 is the perfect addition. Additional sleeping for 4 people with 1 queen bed and 2 singles.